Investing in mutual funds could be one of the way to start SIP but returns may not be that high which can be generated by directly investing into good quality small and mid cap stocks. Hence, we suggest our members to start stock SIP by directly investing in stocks every month. This could be an ideal choice for salaried employees as well as businessmen / entrepreneurs, invest in fundamentally strong small and mid cap companies via SIP (Systematic Investment Plan) route to create wealth over a period of time. Systematic Investment Plan (SIP) is a great way to build your investment portfolio. It is a simple and time tested approach for accumulation of wealth in a disciplined manner. Simply get some savings from your monthly income and Invest in equities for long term. SIP not only allows you to save every month in a disciplined way but also help you ride through ups and downs of stock market. Lets review how SIP approach have benefited our Hidden Gems members during last 3.5 years. Below is the table which illustrates value of Rs. 10,000 invested (every month) in Hidden Gems (Unexplored Multibagger Small Cap Stocks) vis a vis value of Rs. 10,000 invested in BSE Small Cap Index during last 3.5 years. We are delighted to share that average returns of Saral Gyan Hidden Gems (30 stocks) during last 3.5 years is 160% compared to 44% of BSE Small Cap Index. Investment of Rs. 10,000 in Hidden Gems during last 3.5 years not only allowed you to save Rs. 3 lakh but also appreciated your investment giving overall profit of Rs. 4.8 lakh, making your total Hidden Gems stocks portfolio of Rs. 7.8 lakh. However, if you invested the same amount in Small Cap Index, you would be sitting with overall gains of Rs. 1.32 lakh. If we look at past performance from 2010 till June 2013, Hidden Gems SIP stocks have given annualized returns of almost 50%. 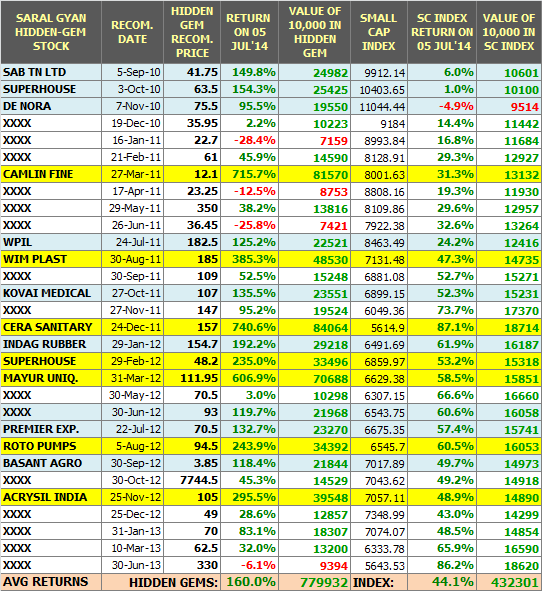 Actual returns of Hidden Gems stocks are on higher side as we suggested partial / full profit booking at higher levels in some of our Hidden Gems like Camlin Fine Chemicals, WPIL, De Nora Ltd, Cravatex, SAB TN Ltd etc and exit in few of non performing companies like National Plastic, Sumedha Fiscal, Puneet Resins etc. Based on company's strong fundamentals, we also suggested our members which earlier recommended Hidden Gems stocks can be added more in their portfolio. Ex: Mayur Uniquoter, Cera Sanitaryware and Wim Plast were some of the stocks which we recommended to our members to accumulate later at much higher price from our initial recommended price. Now profits can be seen as these stocks have given multibagger returns.